Washington DC Placement Program — United States Studies Centre for the 2020 program. 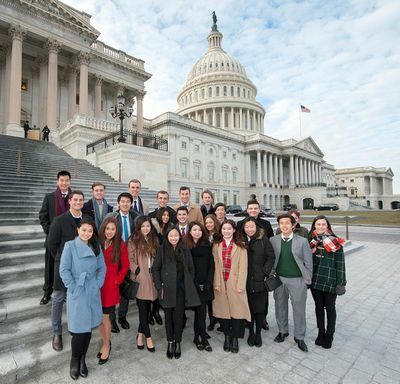 Offered in the Australian summer break (January to March), the Washington DC Placement Program offers an unrivalled opportunity to live, study and work in the seat of American power and witness first-hand the workings of the US government. Undergraduate Students from the University of Western Australia, the University of Sydney Business School and students from the Faculty of Arts and Social Sciences at the University of Sydney are eligible for the nine-week placement program. You will complete three compulsory units of study and receive up to 12 credit points towards your degree. To complement your study, you will complete a professional placement in a leading organisation, which includes placements in congresional offices on Capitol Hill, in think tanks and local government. Students will travel with a member of staff for the first two weeks of the program who will provide program and internship support. The Washington DC Placement Program was developed in 2011 by the US Studies Centre in partnership with the University of California Washington Center (UCDC). The program is offered to University of Western Australia students through a partnership between the US Studies Centre and the Perth USAsia Centre at the University of Western Australia.